You’ve heard it said before, and I’ll say it myself….”It’s the most wonderful time of the year” and I’m not talking about the holidays! BACK TO SCHOOL! WOO HOO! Does it make you a bad parent to be tickled pink your little cherub is going to have to unglue him/herself from your hip? NO! They need to be educated and socialized! And while the tears may flow, and the tantrums abound…secretly, or not so secretly you are thrilled! Not because you don’t love them, but because it’s time for Mom and Mr. Mom to have their lives back! You’ve been there, the stress, sleepless nights, strategizing, researching, staging back up plans or what I call DRP, Disaster Recovery Plan in the event your kid hates camp or vomits endlessly from the petri dish of germs at camp. Your job doesn’t end there… juggling ideas for vacations, and the dreaded… what am I going to do with the kids the end of August when there are NO Camps! You name it…Moms do it all! In our heart of hearts, we want our kids to have the best summer of their lives so you can maintain some kind of sanity, and more importantly so they will have awesome childhood memories. In the back of our minds we fear…if I don’t put a plan in place, my life will chaotic and stressful. Result? You will be found hunkered down in a closet kicking back a bottle of wine, worn out, disheveled and ungroomed. When these little bundle of joys finally head to the bus stop, you try not to high five, jump for joy, or twerk… but you do…because not only is your FREEDOM back, you know they will be safe and happy. For some of you the departure breaks your heart, not me…game on, hit the gym, the tennis courts, Pilates studio or play 18 holes… No more sleepless nights juggling thoughts of camps and playdates… YOU MADE IT! You earned it…because they are GOING BACK TO SCHOOL! And once you get them out of the house, whether or not you work… a little sense of yourself returns, and your identity is back. I’ve been a parent for a while, and still love the newness that back to school brings for both my daughter and myself. I eagerly look forward to hearing how her day was, what she learned in school and how much she missed MaMa! So celebrate… give some cheer or better yet have some BUBBLY! Here’s to us, the Moms and Mr. Moms that have earned the “Freedom” that comes this time of year. Perfect timing seems to be the motto of my beach vacation. Besides the fact that I really, really, really (you get I REALLY) needed the R&R, the beautiful house we stayed in landed in my lap unexpectedly, as did the surprises that followed. The past few weeks of my life were a tidal wave of personal challenges and unexpected emotions. All was washed away with the tide when a leather clad, silky shirted, amazingly talented Lenny Kravitz strutted his stuff across the stage to perform a private concert on the beach! 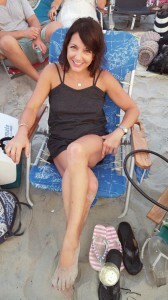 Seriously ON THE BEACH!! What could possibly be better than this? 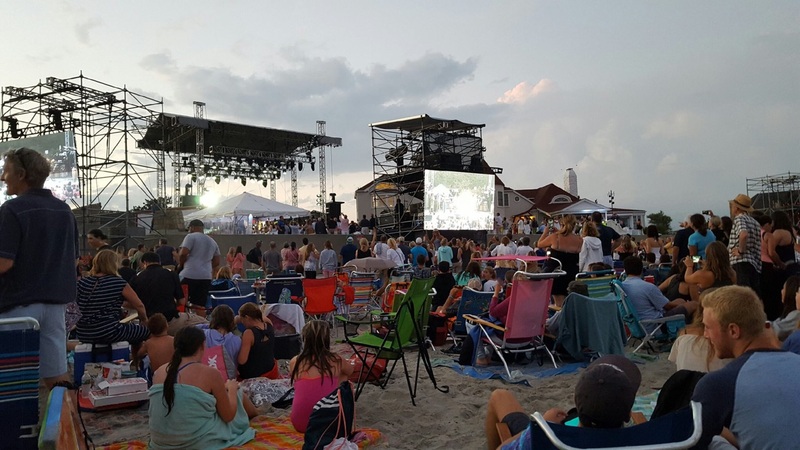 My feet in the sand, a glass of vino in hand, best friends, and the love of my life, my daughter… gigging it up to Lenny’s top hits, under the stars, waves crashing and no generation gap. The highlight of the night? Seeing my seven-year-old playing air guitar and loving her first rock concert with her so cool Mom ha, ha…on the beach…a once of a lifetime moment! Thank you for an amazing evening Mr. Healey and Happy 50th! Perfect timing again…a surprise visit from my BFF Sonjia, who shared in the banter as my special guest on Tuesdays Live with C.C. …if you want to laugh, and I mean really laugh, check out the live show video Narragansett Dayz on my Beaver Tales Facebook fan page, website www.beavertalesbook.com or Twitter page @beavertalesbook! F.Y.I….We had a Wi-Fi snafu, so make sure you view video one and two until we link them together! The week was filled with moments to remember….my daughter perfecting the art of boogie boarding and body surfing, our one on one chats snuggling in bed, sunsets and long walks, lacrosse on the beach, teeing off at the driving range…and jogging through the waves…life doesn’t get better than this…. However, what if perfect timing isn’t so perfect? Like deer in headlights when you are thrown off guard and you don’t know whether to laugh or cringe? I live for these moments, for the levity and comic relief, and in this case … a moment that made me chuckle while most gagged. Has this happened to you? After a lovely nap on the beach, you open your eyes squinting to adjust to the sunlight, sand and sounds, when HOLY CRAP what was that?? Yup, I got a full “smack in the face” view of a very large man sporting a sparkly blue banana hammock, who could have been a stunt double of the guy I waxed in my Beaver Tales Chapter Turf Management. I shook my head with a double take, thinking, I have been waiting for this moment all week! As a Wax-a-nista, I live for these moments. Now don’t get me wrong, I am positive this man was beyond lovely, but sweet Betty Davis… WAX that back man!! My friends laughed as I quickly jogged after this enigma of a hairy man, quickly taking photos to document the moment…timing is everything! I know waxing isn’t for everyone, and I respect that…but for those of you who know me and read my book… I am obsessed with it! I so wanted to speak with him and ask why he doesn’t wax? But I was quickly stifled as my GF told me he’s a local and loves to strut his turf every day on the beach. Good for him! Now THAT was PERFECT TIMING! !